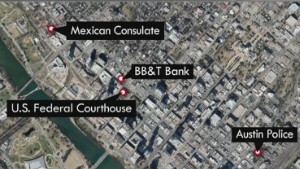 (CNN) -- A man shot up a federal courthouse and a Mexican consulate -- which he also seemingly tried to set ablaze -- in Austin, Texas, early Friday before being shot dead outside police headquarters, that city's police chief said. Acevedo said he was an Austin resident who had a criminal history. Authorities have not offered a motive, but the police chief said that the shooter's "violent anti-government behavior" -- as evidenced by attacking buildings that belong to Mexico's government, the U.S. government and, in the police headquarters, the city government -- may have come from ongoing and often vitriolic debates in society. "Our political discourse has become very heated and sometimes very angry, and sometimes the rhetoric is not healthy," Acevedo said, adding that the divisive immigration debate "comes to mind," given that the federal courthouse and Mexican Consulate were targeted. "I would venture, based on my training and experience, that the political rhetoric might have fed into some of this." The first 911 calls about gunshots came in at 2:22 a.m. Friday, with some reporting a "possible automatic weapon being fired" a few minutes later. Very soon after that, police started to hear about gunfire near a recently opened federal courthouse and then at the city's nearby Mexican Consulate. Acevedo later said the suspect -- using small cylinders often used for camping -- is thought to have ignited a fire at the consulate, though those flames were extinguished before any extensive damage was done. The police headquarters "came under attack" about 2:32 a.m., Acevedo said, at which time a sergeant with the department's mounted police unit happened to be outside, putting away horses. "As he held two horses with one hand, he discharged ... at least one round with a single-handed shot," the chief said. "That would have been one heck of a shot. So part of our investigation will be whether the suspect died from our gunshot, from a self-inflicted gunshot or from a combination of both." After the gunman went down, officers spotted "suspicious cylinders" inside his van. And when they dragged the gunman away, officers noticed "some type of vest on the suspect" -- something that Acevedo said could have been "simply a protective vest or potentially an IED suicide-type vest that is known to be used around the world." Authorities immediately called in the bomb squad and closed off the surrounding area, including for a time stopping all traffic on a stretch of Interstate 35. A few hours later, they determined there were no explosives at the site. The suspect's residence "has been secured and is safe," according to Acevedo's twitter account. Acevedo said that investigators, including FBI agents, "will be looking at everything," even social media accounts, to try to determine what the gunman was thinking. The chief also said that he hopes the incident -- coming at a time of much-publicized, deep-seated anger at police after a Missouri grand jury's decision not to charge a Ferguson police officer in the fatal shooting of Michael Brown -- prompts people to think about the dangers that police face, and overcome, every day to keep residents safe. "We are under siege at times," Acevedo said. "And it's important for people to realize that the men and women in this profession are (the public's defense) when it comes to ... any type of threat, from terrorists or the common criminal." CNN's Tina Burnside and Joshua Berlinger contributed to this report.